Harp & Soul / Shamanz SUmmer LIVE! We (Harp & Soul), are happy to announce our summer live with the original members of the band on July 5th. We are delighted to have the talented members of Shamanz share the evening with us! Come on down. Special prize to the one dressed most summery!! Our CD "Lemongrass" is on sale! 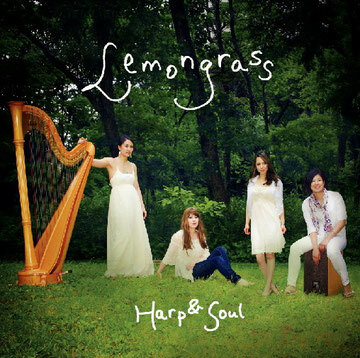 Harp & Soul CD "Lemongrass"
We now have a Harp & Soul website! Harp & Soul is a 4 woman band made up of musicians who play their favorite tunes together. Vocalist and songwriter Aimee Blackschleger is a singer whose voice has been heard in many commercials, games and anime songs in Japan. Her original songs and lyrics are one of a kind, emotional and overwhelmingly beautiful - the members are always on the verge of tears every time she introduces a new song. Kari Melody has been grabbing the hearts of many, singing at live shows and events, with her exceptionally deep and soulful voice. Percussionist Gisappe comes from a rock background, having played the drums since she was 13. She has taken up the cajon, which is a box-shaped drum originally used in Afro-Peruvian music, to add a heartbeat to the band. 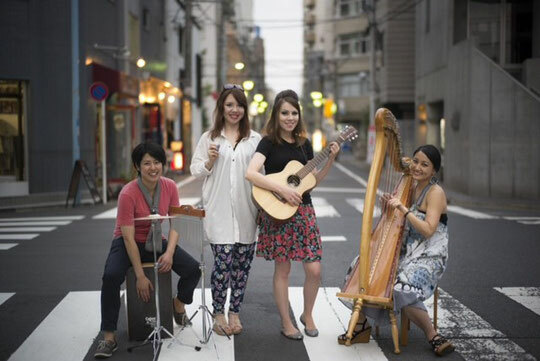 Finally, Kaoru Arai-Colucci plays the harp - the concert grand harp as well as the Irish harp, to accompany and add color to this unique indie/pop girl-band.